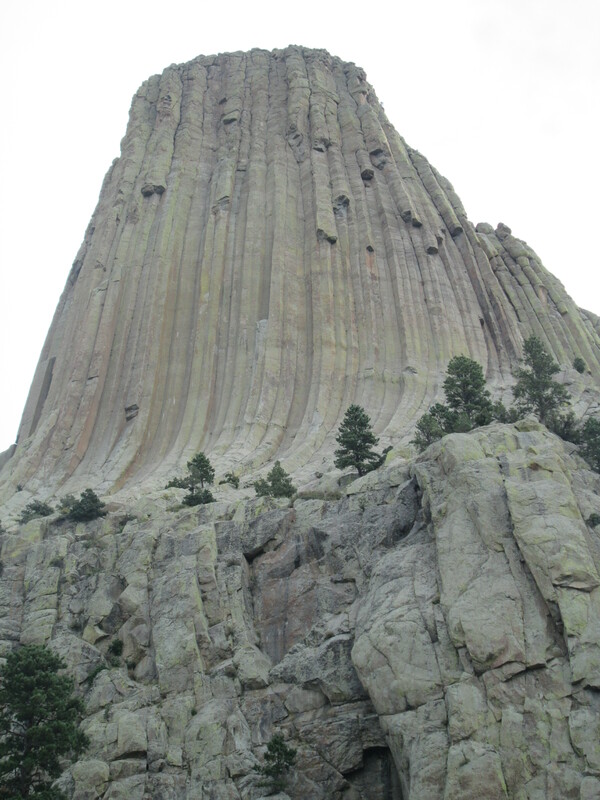 Surprisingly enough, although I have been to Rapid City and its environs before, I had never heard of Devil’s Tower. I only stumbled across it this time because it was featured on a throwaway tourist map of the area that was forced upon me by some motel. Devil’s Tower! I thought excitedly. I love landmarks named Devil! Consider, for example, The Devil’s Golf Course in Death Valley – if it was named after you-know-who, you know it’s going to be worth seeing. 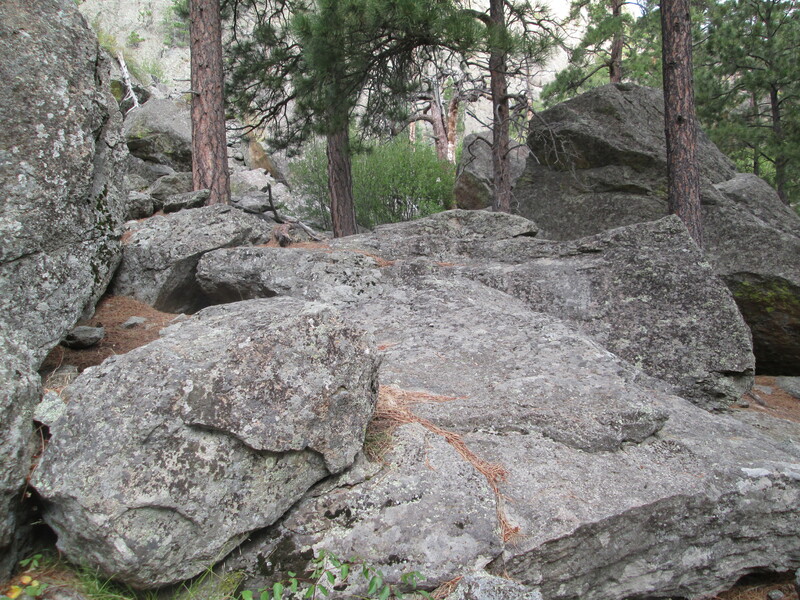 Contrary to its name, Devil’s Tower was not traditionally perceived as a haven for the Dark Lord, but rather as a holy place that featured prominently in both Native American lore and in the traditions of white settlers of the region. I myself am not a very spiritual person. But when you’re standing in the shadow of this unusually designed and seemingly inexplicable 900-foot monolith, it’s hard not to be moved. But as permanent and everlasting as it seems, the tower, of course, will not live forever. All about its feet lies abundant proof that it, too, is slowly self-destructing, that the days of its existence may be numbered to but a moment in geologic time. For while the igneous rock of which the tower is formed is far tougher and less subject to the forces of erosion than the sedimentary rock that once surrounded it, it also cannot survive indefinitely. One by one, the columns of which the tower is constructed will break off and crumple in heaps all around it, creating a field of giant stones in the midst of this quiet and peaceful wood. It will be a lengthy process. It has been a hundred years since the last column collapsed, and in the meantime, the tower continues to grow taller as more sediment is eroded from the plain. 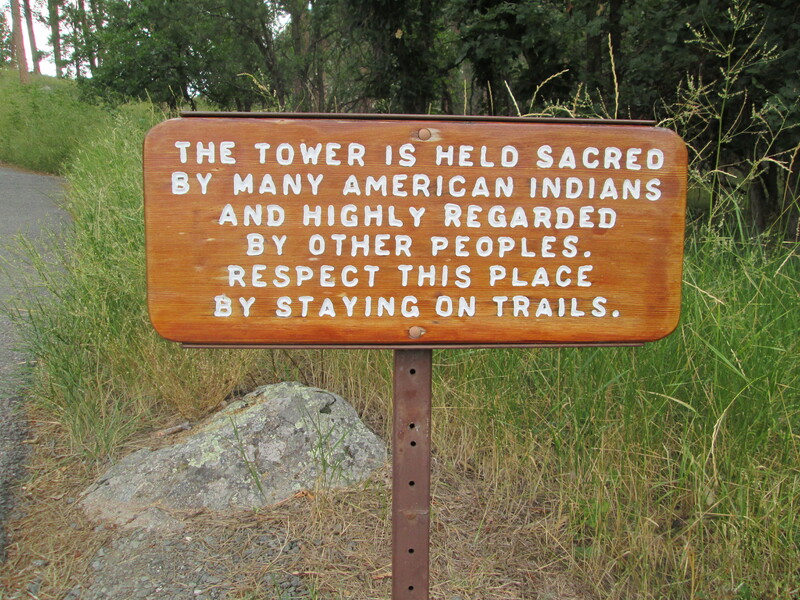 The tower itself also stands immune to one of the direst natural calamities of the region – the wildfire. These blackened trees appear to present evidence of just such a calamity. Fires are a natural part of the western ecology, and, left to their own devices, help to renew the forest floor without causing excessive damage to established trees. But, as is often the case when people interfere with nature, fires have become more devastating to our vast areas of forest in the last hundred years. This is because human efforts to suppress wildfires have caused buildups of fuel in wooded areas – which means that when fires do burn, they burn much hotter and are far more destructive. It’s a lesson for all of us. Every year our skies are darkened by the smoke and soot of wildfires; every year our fire fighters risk their lives attempting to control these blazes in an effort to spare our homes and other places we hold dear. It’s only natural that in our approach to the world, we put humans first. But at what cost? Do we really derive any long-term benefit from interfering with the natural ebb and flow of our forest ecologies? Or are we merely postponing the inevitable and, in the process, causing greater harm than good? It is human nature to develop attachment to the land. The land in which we are born, the land in which we grow up, the lands in which we experience our first love, our first adventure, our first taste of freedom; the land in which we choose to grow old and die. Places form a large part of how we define ourselves, of how we comprehend our position in the world. Who among us has not gone out of our way to drive past a house we lived in as a child? Who among us does not remember “where we were” during important events in history, such as the John F. Kennedy assassination, or 9/11? Who among us does not imagine the chapters of our lives as beginning and ending with the places we have lived, because every new place is, in our minds, distinctly different from the last, even if the move was only across a state or down the block? The Native Americans understood this. Many of their origin stories are centered around the land, around the gifts of land, the gifts of places that were granted to their people by their god or gods. It is perhaps one of the reasons why the shift to reservations was so painful, so intolerable to the Native tribes. You cannot simply remove a people from one land to another and expect them to be satisfied, even if the trade were, on paper, fair and equal. The land does not represent merely a way of life, a means of earning a living. It is the very essence of a people. We will always fight to protect our sacred places, whether they be a stretch of coastline on the eastern seaboard, a beloved old elm in our own front yard, or a four-block neighborhood in the city of Cleveland. Places move and inspire us. We cannot bear to see them altered or destroyed. But of course, eventually they must be. 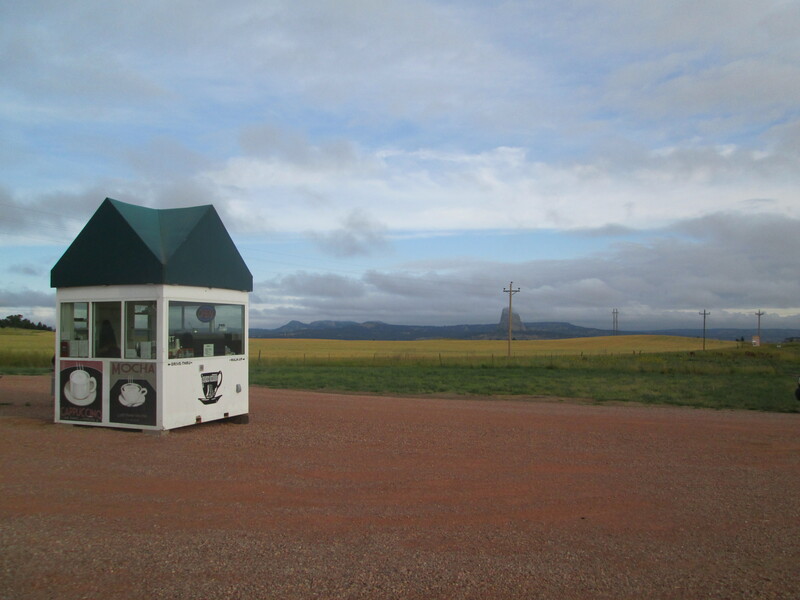 Even a monument like Devil’s Tower cannot stand forever. Nothing can. But perhaps we can take comfort in knowing that this particular landmark will continue to stand, for as long as we ourselves are living, and for many generations after us. It is, for all human intents and purposes, an essential and everlasting part of the landscape. It is land at its very best. Permanent. Indestructible. Sacred. 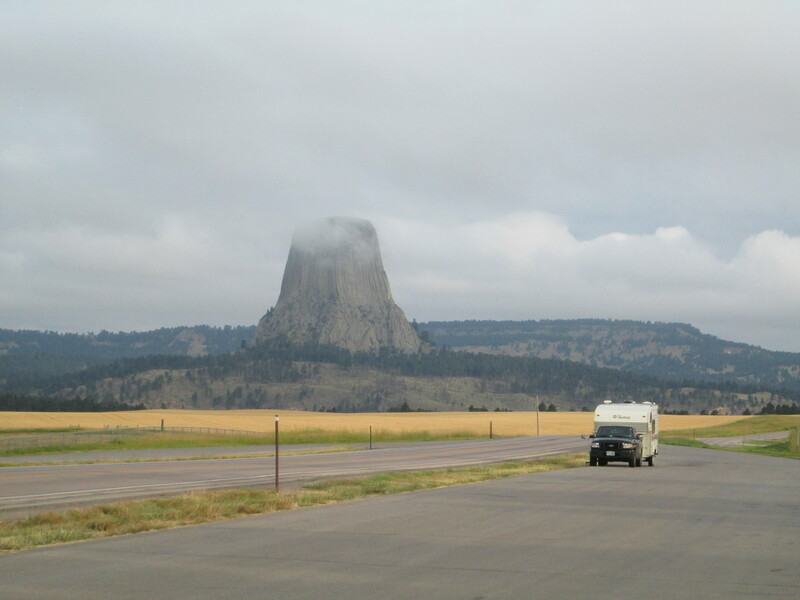 This entry was posted in Travel and tagged books, Close Encounters of the Third Kind, Devil's Tower, landscapes, memoir, reading, road, road trip, roadtrip, The Long Road Home, travel, United States of America (Country), Wyoming on September 5, 2014 by lorilschafer. I’m enjoying reading about these parts of your country, Lori. What you have said about the intensity of the wildfires is similar to what happens here in Australia. There have been some interesting writings about the way the land had been managed by the Indigenous Australians before the arrival of Europeans. Its interesting stuff. 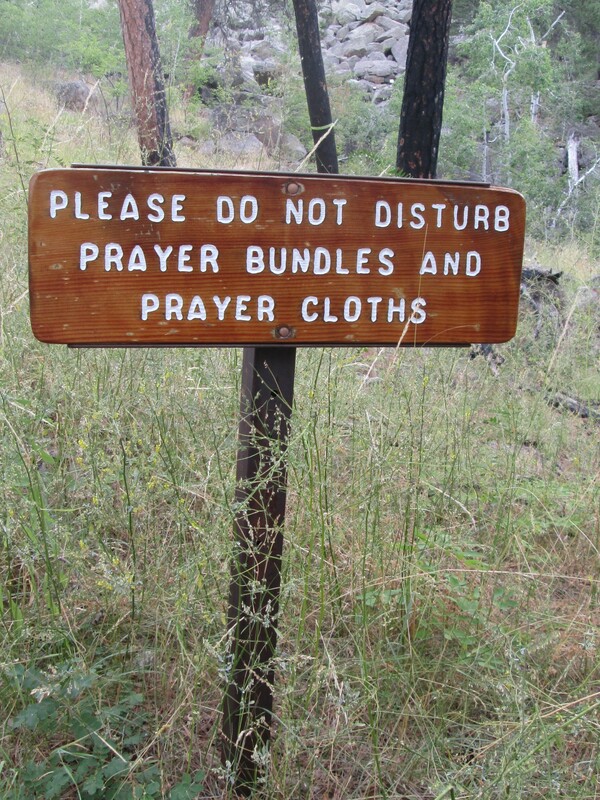 I was surprised to see reference on a sign to American Indians. I thought that term was no longer in use. Am I incorrect in thinking that? I agree with you about the relationship with the land. It is particularly strong for the Australian Aboriginal peoples and there is a lot of discussion about land ownership going on, which is a good thing. Curious – do Australia’s aboriginal peoples have naming issues vis-a-vis those of European descent? Over here, of course, we also have the black/Black/African American dilemma, which is complicated by the fact that not everyone has the same opinion on what they prefer to be called. It can make it very difficult to be respectful despite our best intentions! Hi Lori, Thanks for linking to that very interesting article. The issue of labels reminds me also of the discussion that ensued on my blog in relation to people with disabilities. I think (hope) that as long as the intent is respectful people don’t really mind. The situation seems to be quite similar here in Australia and has been highlighted for me with the curriculum writing that I have been doing for the past few years. Integrating Indigenous Perspectives into the curriculum is a priority. We have learned that there are particular ways of doing so that are respectful, and others that are disrespectful. We write about Aboriginal peoples or Indigenous peoples of Australia and Torres Strait Islander peoples to acknowledge the great variety of language groups that exist across the country. The term language group is preferred to tribe and other such terms. As you say, despite our best intentions, being respectful can still be a difficult thing to achieve. I actually just started reading a book on Australian history (about which I know nothing). The opening chapters describe the Aboriginals, their language groups, and even the way they used fire, as you mentioned the other day! I think I’m going to find it very interesting to contrast and compare the history of Australian colonization with our own, as I would imagine there are numerous similarities, particularly in the relationship of the colonizers to the native peoples. I’ll be interested to hear your thoughts and comparisons, Lori. Which book are you reading? I’m not aware of that one. I have read some of (it’s a huge book) “The Biggest Estate on Earth”. It’s a very interesting read about the land management practices of Indigenous Australians pre-1788 and the changes that have occurred in the land since that time when their traditional ways of managing the land have not be implemented. Your video was fascinating but the extra detail re the sacred nature of the site is a treat. Great pics too.